How do I make it big on social media? What is my story – and who is my audience? What content should I post to achieve #success? How do I go viral…or how long will it take me to get noticed? Selfie Made is a one-of-a-kind guide to creating a digital identity, finding an audience, and building a powerful brand – your own! – on the Internet. Whether you want to be in front of or behind the camera, produce click-worthy content, or start your own business, this audiobook is the place to begin. 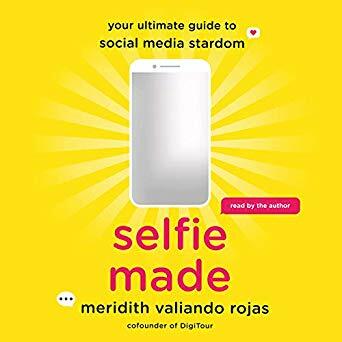 Authored by Meridith Valiando Rojas, the hugely successful (and super friendly IRL) founder of DigiTour who has worked with every major star from YouTube to Musical.ly, this collection of personal anecdotes and professional advice, tricks of the trade, and behind-the-screen secrets will give you everything you need for your social media toolkit.